The deluxe 2LP re-issue of The Branches is pressed on clear vinyl and packaged in a gatefold jacket with the artwork, originally drawn by Bioniq, colorized by Roman Pokrovsky. Besides everything being remastered and including new work from Long Arm himself, they also added a second vinyl with various remixes by on the one hand like-minded artists like Hidden Orchestra, Dday One and 40 Winks, with whom Long Arm also shares artistic relationships and friendships, and on the other hand more genre-overarching and experimental remixes from such acclaimed artists as Robag Wruhme, Sieren, Yoko Duo, Berry Weight, Empt and Speck from CYNE, which will surely make for a unique listening experience. 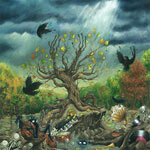 Gotta check out the chopped up loops on the title track ''The Branches''! This song conjures up so many different images and feelings. The beats are alive with so much feeling. Love the inventive samples and loops and how crazy they are chopped up. Seriously can't stress how great these beats are. They are exactly like the album cover. Pure, exotic, and trippy. 5 stars out of 5 for sure.